Veneers are very thin shells of porcelain used to improve the shape, color, position, or size of your teeth. The aesthetic qualities of porcelain veneers are unsurpassed, and because they are bonded to just the front surface of the teeth, veneers are a very conservative treatment option as well. 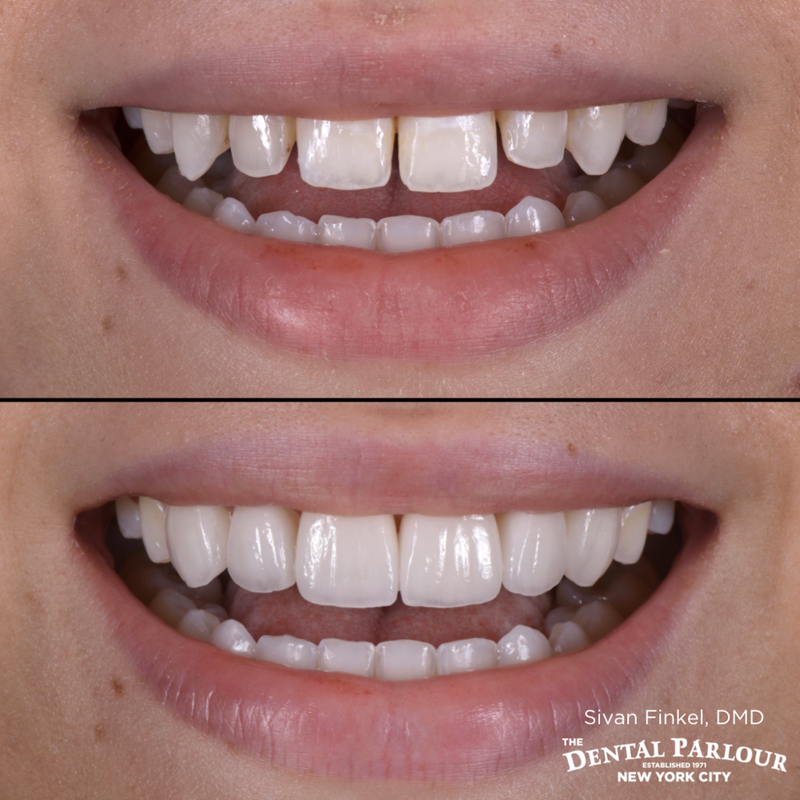 Making porcelain veneers look natural and undetectable is quite challenging, but this is Dr. Sivan Finkel’s specialty. Crowns are made for teeth that have been so compromised by decay that a simple filling would not suffice. A crown gives a broken-down tooth 360 degree protection, and restores its natural bite, look, and feel. Today, these restorations can be made metal-free in 100% porcelain, eliminating the black line at the gums you may have noticed in older crowns. Bonding is a conservative, one-visit method of adhering tooth-colored “composite” material to a defect in a tooth’s shape or size. Bonding can be used to repair chips, close gaps between teeth, and even correct the color of a tooth. When decay has taken hold in the grooves of a tooth or in between the teeth, the weakened tooth structure is replaced with sturdy, tooth-colored composite material that is exactly contoured and polished to replicate the missing portion. We can also replace any existing silver fillings with this more aesthetic alternative. When deep decay (or trauma) has caused the nerve at the core of your tooth to be irritated, the only way to resolve the toothache is a root canal. We painlessly replace the inflamed nerve with a sterile material, and in most cases follow up with a crown for the tooth's protection. When you're missing a tooth, or have a tooth that is so damaged it needs to be extracted, a dental implant is the most advanced method available to replace it. An implant is a titanium post that mimics your tooth’s root, upon which we build a crown. Implant crowns not only look and feel like the real thing, they are actually stronger than natural teeth could ever be. Whether you're missing one tooth or many, implants can put the confidence back in your smile. Misaligned teeth are not just unaesthetic; it's been shown that crowded teeth invite a more aggressive type of bacteria into those unnaturally tight spaces. Using a series of clear plastic trays, we can dramatically correct a crooked smile in a matter of months. Dr. Sivan Finkel is extensively trained in — and teaches — esthetic dentistry, the art of smile transformations. Whether your smile needs to be rejuvenated or you want it completely re-imagined, Dr. Finkel will design and create your new look with an artist's attention to detail. Dr. Finkel is an early adopter of a concept known as Digital Smile Design. This workflow uses technology to define the symmetries and asymmetries in each face before the new smile is designed, ensuring that the smile is in harmony with the overall face. In 2016, Dr. Finkel attained the designation of "DSD Master," one of the first dentists in the country to earn this status. One of the most common and conservative treatments we perform. Whitening can instantly transform your smile by reversing years of unsightly stains and discoloration. A thorough cleaning and exam every six months helps maintain the health of your mouth, and can also help us spot other potentially life-threatening conditions, such as oral cancer. We use an intra-oral camera to show you our findings, and even though our digital x-rays deliver 90% less radiation than traditional systems, we make it a point to never take a single unnecessary x-ray. Oral cancer is on the rise, with more than 30,000 new cases diagnosed in the U.S. each year and more than 8,000 deaths annually. The five-year survival rate for most oral cancers is roughly 50%. The good news, however, is that oral cancer is largely curable when detected early on. We perform a thorough oral cancer screening as part of every exam, and are proud to use the VELscope system. The VELscope is the only device cleared by the FDA to help detect oral mucosal lesions that are invisible to the naked eye. It's quick, painless, and may save your life.